Worldreader has an ambitious and yet beautifully simple mission: Books for All. Worldreader uses e-reader and mobile phone network technology to leapfrog over the challenge of getting paper books into remote areas of the developing world. The e-readers bring a virtually unlimited library of books to kids who would otherwise have had access to few books, if any. Last year, the Worldreader iRead pilot program brought 500 Kindle e-readers to Kade and Adeiso, Ghana. Watch the kids’ reactions when they get Kindles! The purpose of this fundraising campaign is to help Worldreader fulfill its promise this year in Kade and Adeiso. 1. Click this link to go to the Amazon Gift Card purchase page in a new tab. Worldreader will use the gift cards to purchase Kindles for their programs. 2. Using the recipient email address booklending@worldreader.org (N.B. please note that this is a .org email address, not .com), purchase a gift card in any denomination, large or small. Please give generously, but no amount is too small to help — it’s up to you. 3. Worldreader is a not-for-profit and your donation is tax deductible. If you would like a tax receipt for your donation, please forward your Amazon Gift Cards purchase receipt to me (catherine@booklending.com) along with your full name and mailing address, and Worldreader will send out a tax receipt. Donating $200 Or More …? Our Friends at M-Edge Have a Gift For You! M-Edge, creator of e-reader and tablet accessories, has just introduced MyEdge, a groundbreaking new way to make a completely customized protective jacket for your Kindle (or other ereader or tablet). If you are one of the first 25 (update – there are only 22 left!) to donate $200 or more in this fundraising campaign, M-Edge will give you a promo code that you can redeem for your very own custom-designed MyEdge Kindle jacket. 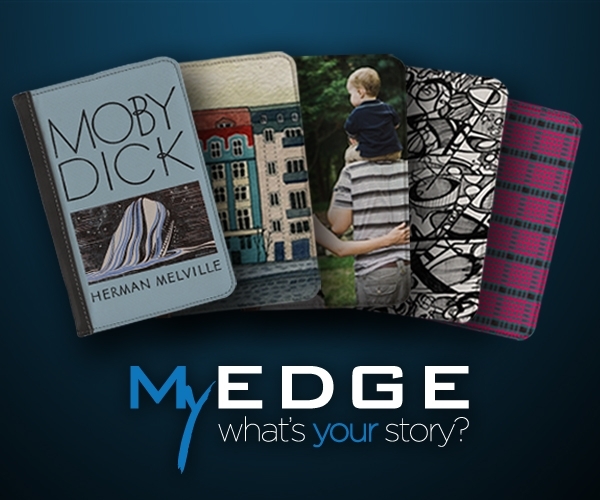 Recently featured on The Today Show, MyEdge is the first service to allow customers to upload personal artwork and photographs to create customized e-reader jackets at uniquely affordable costs of $40 for Kindle and Nook covers and $50 for iPad. The MyEdge web app provides all the drawing and design tools a user needs in an easy-to-navigate toolbar. It’s addictively easy and fun to use; I love it! Click here to check out MyEdge for yourself. M-Edge is a committed supporter of Worldreader; they donate a jacket and e-Luminator booklight for each e-reader Worldreader provides to students. The folks at M-Edge were excited to hear about this fundraising campaign; so excited, in fact, that M-Edge is gifting a promo code redeemable for one MyEdge Kindle jacket (a $40 value) to the first 25 generous BookLending.com members who donate a $200 or higher gift card to Worldreader in this campaign! You could be able to design your very own unique Kindle jacket as a thank you for your Amazon gift card donation to the Worldreader iRead II project in Ghana, but hurry, because only the first 25 donors of $200+ to claim their promo codes will be eligible. Just forward your Amazon Gift Cards purchase receipt for your Worldreader gift card donation of $200 or more to me (catherine@booklending.com) and, if you are one of the first 25 donors to do so, I’ll send out your promo code and instructions and you’ll be making your very own custom-designed Kindle jacket before you know it!